A Conceptual Guide to Thermodynamics is a supplement, designed to work in conjunction with your undergraduate or graduate thermodynamics textbook. The book itself provides explicit links to twenty one of the most commonly used textbooks in various science and engineering disciplines. However, we recognize that there are a great many texts out there. Since yours might not be included in the supplement—and since new editions keep coming out all the time—on this website we maintain materials for a greatly expanded list of reference textbooks, including older and newer editions as well as less popular titles. 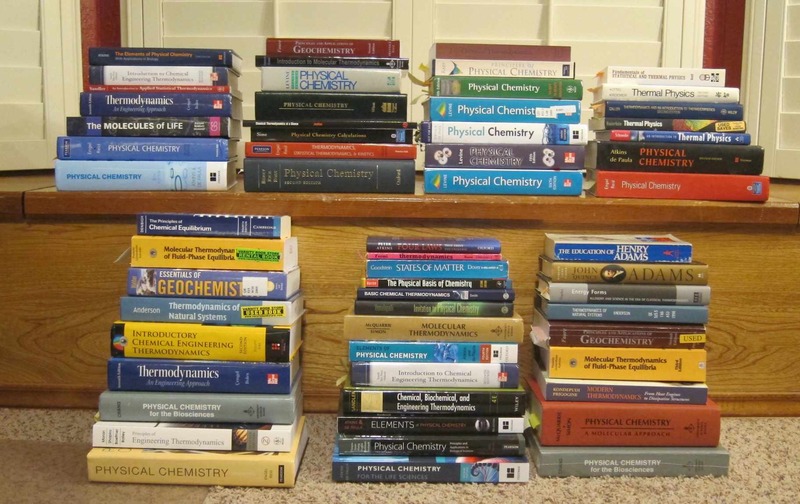 To find your textbook, first click on your discipline from the list presented at right. This will then expand into a complete list of titles and editions available for your specific field. Click on a given title/edition to access all available text-specific content. if your textbook isn't listed, please let us know. P. Atkins and J. de Paula, Physical Chemistry for the Life Sciences, 2nd ed. (Freeman 2011). P. Atkins and J. de Paula, Elements of Physical Chemistry, 6th ed. (Freeman 2013). P. Atkins and J. de Paula, Elements of Physical Chemistry, 5th ed. (Freeman 2009). P. Atkins and J. de Paula, Elements of Physical Chemistry, 4th ed. (Freeman 2005). R. Chang, Physical Chemistry for the Biosciences, 1st ed. (University Science Books 2005). J. Kuriyan et al., The Molecules of Life: Physical and Chemical Principles, 1st ed. (Garland Science 2013). I. Tinoco et al., Physical Chemistry: Principles and Applications in Biological Sciences, 5th ed. (Prentice-Hall 2013). P. Atkins, J. de Paula, and J. Keeler, Physical Chemistry, 11th ed. (Oxford University Press 2018). P. Atkins and J. de Paula, Physical Chemistry, 10th ed. (Freeman 2014). P. Atkins and J. de Paula, Physical Chemistry, 9th ed. (Freeman 2010). P. Atkins and J. de Paula, Physical Chemistry, 8th ed. (Freeman 2006). R. S. Berry, S. A. Rice, and J. Ross, Physical Chemistry, 2nd ed. (Oxford 2000). K. Denbigh, The Principles of Chemical Equilibrium, 4th ed. (Cambridge 1981). K. A. Dill and S. Bromberg, Molecular Driving Forces, 2nd ed. (Garland Science 2011). T. Engel and P. Reid, Physical Chemistry, 3rd ed. (Pearson 2013). T. Engel and P. Reid, Physical Chemistry, 2nd ed. (Pearson 2010). T. Engel and P. Reid, Physical Chemistry, 1st ed. (Pearson 2006). R. M. Hanson and S. Green, Introduction to Molecular Thermodynamics, 1st ed. (University Science Books 2008). H. D. B. Jenkins, Chemical Thermodynamics at a Glance, 1st ed. (Blackwell 2008). I. M. Klotz and R. M. Rosenberg, Chemical Thermodynamics: Basic Concepts and Methods, 7th ed. (Wiley 2008). D. Kondepudi and I. Prigogine, Modern Thermodynamics, 1st ed. (Wiley 1998). K. J. Laidler, J. H. Meiser, and B. C. Sanctuary, Physical Chemistry, ebook. (Houghton Mifflin 2010). K. J. Laidler, J. H. Meiser, and B. C. Sanctuary, Physical Chemistry, 4th ed. (Houghton Mifflin 2003). I. N. Levine, Physical Chemistry, 6th ed. (McGraw-Hill 2009). I. N. Levine, Physical Chemistry, 5th ed. (McGraw-Hill 2002). D. A. McQuarrie and J. D. Simon, Physical Chemistry, 1st ed. (University Science Books 1997). D. A. McQuarrie and J. D. Simon, Molecular Thermodynamics, 1st ed. (University Science Books 1999). L. M. Raff, Principles of Physical Chemistry, Part A, 1st ed. (Prentice-Hall 2001). P. A. Rock, Chemical Thermodynamics, reissue (University Science Books 2003). R. J. Silbey, R. A. Alberty, and M. G. Bawendi, Physical Chemistry, 4th ed. (Wiley 2005). J. S. Winn, Physical Chemistry, 1st ed. (Harper Collins 1995). K. E. Bett, J. S. Rowlinson, and G. Saville, Thermodynamics for Chemical Engineers, reissue. (MIT Press 2003). J. R. Elliott and C. T. Lira, Introductory Chemical Engineering Thermodynamics, 2nd ed. (Prentice-Hall 2012). M. D. Koretsky, Engineering and Chemical Thermodynamics, 2nd ed. (Wiley 2012). J. J. de Pablo and J. D. Schieber, Molecular Engineering Thermodynamics, 1st ed. (Cambridge 2014). J. M. Prausnitz, R. N. Lichtenthaler, and E. Gomes de Azevedo, Molecular Thermodynamics of Fluid-Phase Equilibria, 3rd ed. (Prentice-Hall 1999). S. I. Sandler, An Introduction to Applied Statistical Mechanics, 1st ed. (Wiley 2011). S. I. Sandler, Chemical, Biochemical, and Engineering Thermodynamics, 4th ed. (Wiley 2006). J. M. Smith, H. C. Van Ness, and M. M. Abbott, Introduction to Chemical Engineering Thermodynamics, 7th ed. (McGraw-Hill 2005). A. Bejan, Advanced Engineering Thermodynamics, 3rd ed. (Wiley 2006). Y. A. Cengel and M. A. Boles, Thermodynamics: An Engineering Approach, 7th ed. (McGraw-Hill 2010). B. Diu et al., Thermodynamique, 1st ed. (Hermann 2007). M. J. Moran et al., Fundamentals of Engineering Thermodynamics, 8th ed. (Wiley 2014). M. J. Moran et al., Fundamentals of Engineering Thermodynamics, 7th ed. (Wiley 2012). F. Albarede, Geochemistry: An Introduction, 2nd ed. (Cambridge 2009). F. Albarede, Geochemistry: An Introduction, 1st ed. (Cambridge 2003). G. Anderson, Thermodynamics of Natural Systems, 2nd ed. (Cambridge 2005). G. Faure, Principles and Applications of Geochemistry, 2nd ed. (Prentice-Hall 1998). B. Fegley, Jr., Practical Chemical Thermodynamics for Geoscientists, 1st ed. (Academic 2012). J. V. Walther, Essentials of Geochemistry, 2nd ed. (Jones & Bartlett 2009). J. V. Walther, Essentials of Geochemistry, 1st ed. (Jones & Bartlett 2005). R. Baierlein, Thermal Physics, 1st ed. (Cambridge 1999). R. Bowley and M. Sanchez, Introductory Statistical Mechanics, 2nd ed. (Oxford 2000). R. Bowley and M. Sanchez, Introductory Statistical Mechanics, 1st ed. (Oxford 1996). H. B. Callen, Thermodynamics and an Introduction to Thermostatics, 2nd ed. (Wiley 1985). E. Fermi, Thermodynamics, reissue (Dover 1956). D. L. Goodstein, States of Matter, 2nd ed. (Dover 1985). C. Kittel and H. Kroemer, Thermal Physics, 2nd ed. (Freeman 1980). F. Reif, Fundamentals of Statistical and Thermal Physics, reissue (Waveland Press 2008). D. Schroeder, An Introduction to Thermal Physics, 1st ed. (Addison-Wesley 2000).